When was the last time you purchased new window treatments? If you are looking for a new and trendy type of window treatments for your home, look no further than custom shades by Graber. These types of window treatments are stylish and functional, outperforming all their competitors on the market. There are plenty of customizable styles and designs to choose from to balance light, heat, and glare control and make the best window treatments for you possible. Cellular shades are not only stylish window treatments that come in the shape of honeycombs, but perfect for energy efficiency. The insulation created by the cellular shades traps air in pockets, decreasing the amount of energy you are consuming. Featuring alternating sheer and opaque fabrics, layered shades are a type of window treatments available that serve as a fantastic means of controlling indoor light, while also blocking UV rays as well. This form of window treatments allows for light to gently be filtered indoors when these shades are open, and the layers all align with one another. Renewable and natural materials like bamboo and rattan are used to create natural shades which sport natural patterns that create a stunning natural look. These window treatments are commonly used to forge a calm and relaxing area with a natural feel to it. The pleated shades made by Graber are another form of window treatments that aid greatly with filtering sunlight but come with their own set of benefits as well. Their design is made specifically to add depth and structure to any room that boasts these window treatments. If you are looker for a cleaner, more upscale look, then roller shades may be the window treatments for you. Roller shades come in a wide variety of patterns and textures that one of which is sure to fit the design of your interior. They are also window treatments that are made from allergen-free materials, so you will not have to ever worry about poor air quality with roller shades. Made from only one piece of fabric, roman shades utilize a horizontal folding pattern that you pull up and down on to control the different shading of the room, available in three different opacities. The premium fabric used for roman shades adds an exquisite taste to any room, while also serving their practical purpose. If UV protection is a major focus for your window treatments, then look for sheer shades from Graber. The sheer Graber fabric will block out the harmful UV rays that will properly filter light with their sleek, airy design while open. 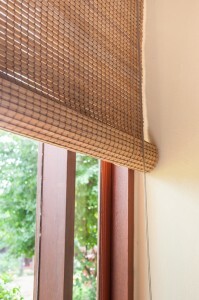 If you are looking to gain a great look of the outdoors with your window treatments, consider solar shades then. These semi-opaque Graber window treatments will protect you from glare and UV rays while providing an open look outside. Unlike other window treatments, exterior solar shades are more readily prepared to protect and help with controlling the temperature, allowing your home to become more energy efficient than before. They also serve well for your outdoor living spaces. If you have patio doors then sliding panels will prove to be a great choice for your window treatments. With sliding panels, you are able to pick from a wide range of fabrics and materials that best suit your window treatments needs.